Promwad is a member of Analog Devices ‘The Collaborative’ partner program for 3rd party electronics and software developers on Blackfin processors. Blackfin application varies from automotive electronics, servo motor control systems and monitoring systems to multimedia consumer devices. The first Blackfin processor — BF535 — was introduced in 2001. It is distinctive for USB device interface, PCI interface and clock speed up to 350MHz. In 2002 Analog Devices announced the next generation of Blackfin processors with increased operating frequency and support of such popular peripheral interfaces as CAN, Ethernet, PPI. Along with BF53x processor family one should notice a powerful dual-core BF561 processor with core frequency of 500 / 600MHz, 32bit external bus interface and two independent PPI controllers. Launched in 2007 BF54x and BF52x processors extended a list of supported embedded interfaces. High-speed USB OTG controller, SDIO interface and ATAPI controller appeared. All processors support booting from NAND flash memory and advanced copy protection technology called Lockbox. BF54x family is targeted at higher performance and functionality while BF52x family is oriented to embedded systems with strict requirements to power consumption. Analog Devices suggested similar BF52xC processors with embedded audio codec for audio applications. 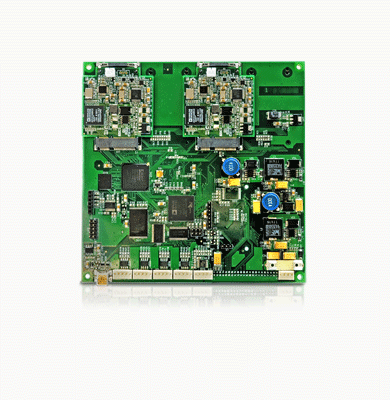 BF549 processor has embedded MOST (Media Oriented System Transport) interface controller and is recommended for use in automotive multimedia electronics. This promising processor series allows to shorten the time for device market entry, decrease the cost and power consumption. Blackfin BF51x processors enable the creation of diverse solutions, such as portable devices, VoIP and industrial applications that require high efficiency at low power consumption. BF51x as well as BF54x family supports Lockbox copy protection technology. Controller of removable storage interface (RSI) can be added and used for SD, MMC, SDIO and CE-ATA connection. Ethernet 10/100 MAC interface is realized in some models as well as the support of IEEE-1588 precision time protocol. New BF60x family consists of 4 processors with binuclear architecture (frequency of 500 MHz). Blackfin kernels are functionally identical to their analogues from previous BF561 generation but due to the improved technological industrial process (move from 130 nm to 65 nm) the chip memory was doubled to 256 Kb L2 SRAM in BF607, BF608, BF609 processors. The internal high-speed bus was also processed. That increased the bandwidth and allowed simultaneous data transmission which is necessary for video processing in high-performance systems. The support of DDR SDRAM was added, PVP (pipelined vision processor) with 83 MHz frequency enabled the processing of HD video with up to 1280x960 resolution on BF609 processor. There are advanced development tools for Blackfin processors: integrated development environment (IDE) VisualDSP from Analog Devices and Linux operating system ported to Blackfin thus providing an access to a large number of open source projects and libraries. Lockbox technology for Blackfin processors is based on the principle of digital signature authentication by using standard encoding algorithms and represents a secure environment for code execution. Secure mode on Blackfin processors allows implementing a system, where only trusted code can be executed in secure environment. For fast embedded system prototyping we use add-on modules from 3rd parties and in-house development: USB-LAN-EZExtender, WiFi-ZigBee-USB, ADV212 Blackfin Module. Do you need custom electronics development based on Blackfin processors?